Unobstructed views of the rugged Kawarau Gorge hillsides and the spectacular Bridal Veil Waterfall ensure that this is a venue with lasting impression. From a boardroom meeting for 2 guests to a private wine and food festival for 200 guests, The Winehouse & Kitchen is a fantastic venue. Our landscaped grounds include a croquet green, secret garden, potager garden and children’s sandhill. A finalist in the 2008 "Cuisine Restaurant of the Year" award we are located just 20 minutes from Queenstown and adjacent to the world famous Kawarau Bungy Centre site. 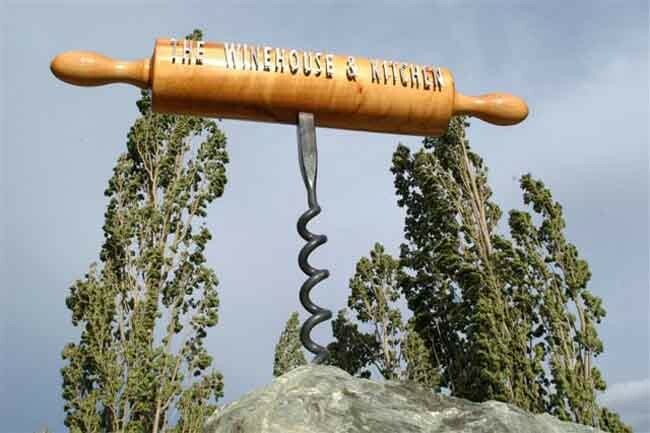 The Winehouse & Kitchen was developed by Henry van Asch and Tom Hutchison and is the showcase for their wine labels van Asch, Rock Ferry and Freefall. Head Chef, Chris Whiting, and his talented team strive in the kitchen to produce wholesome, hearty, healthy, farmhouse style food using the freshest produce, best quality meats and seafood.While the net is cast far and wide to pick up the star ingredients available from other regions, it is on our door step in Gibbston and the Cromwell basin's that we believe the country's finest products are available. We look forward to sharing our wine and food with you soon.